So you’re in the market to buy a mobility scooter, but you’re not sure where to start? What journeys do you plan to make? What terrains are you likely to encounter? Mobility scooters come in all shapes and sizes. The type of journey and terrain you’re likely to cover will go a long way in determining whether you go for a small, medium or larger scooter. If you’re planning on only going for short trips where the terrain is reasonably flat such as to the local shops or a nearby friend’s house, then a small sized scooter may be what you’re looking for. Small scooters come in 3-wheel and 4-wheel layouts with some able to be taken apart or folded for easy travel. For more extensive users who are likely to drive in longer, rugged or hilly terrains should consider a medium or large sized scooter as their choice. Larger models typically come with better shock absorption, heavier duty tyres and batteries that provide longer range. Driving where there are tight corners and small spaces can prove quite difficult with some scooters. 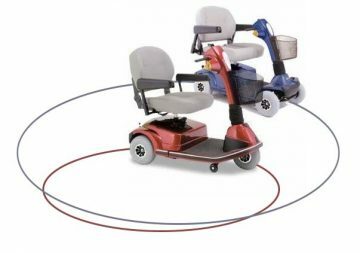 3-wheelers are best known for their short turning radius and is recommended for those who are regularly driving indoors e.g around the home or supermarket. If you only need enough room to carry a few items back from the shops e.g. newspaper or milk and bread then the front basket should be enough space. Additional storage compartments located under the seat are available with some models. Bag accessories are another option and can attach easily behind the seat. All scooters come with a maximum weight capacity. Smaller models typically see limits of between 100kg – 130kg. Larger and Bariatric models on the other hand are able to accommodate much larger weights. Your weight should not exceed the recommended weight capacity outlined inside the products specifications. This is designed for your safety and ignoring this is likely to void your warranty with the manufacturer. You can expect to see more features across the larger models and this will see an increase in the overall cost. Funding schemes such as NDIS, SWEP and DVA are available and can greatly help reduce the cost of your mobility scooter. We recommend talking to us or your occupation therapist to see if you qualify for any type of funding. Models that are built for longer distances and off-road terrains are generally built with extra comfort in mind. You’ll see this in the comfort of the chair, front and rear air suspension and pneumatic (air filled) tyres. The tiller (steering controls) can be adjusted forwards and backwards on many scooters giving you better posture while driving. 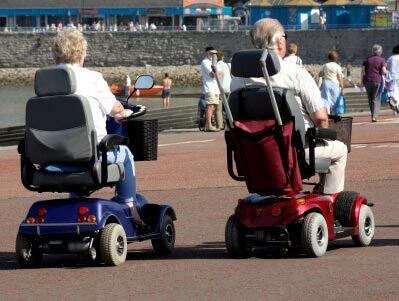 Some have adjustable acceleration and braking controls allowing those with limited mobility on one side of their body to opt for driving operation to their preferred side. Travel scooters that can be taken apart are designed to be lightweight and consequently don’t normally provide the comfort features available in other larger models. If at the end of reading this you’re still unsure which scooter to go for, why not test drive a few? You’ll get a feel for what’s out there and we’re more than happy to answer any of your questions or concerns. If you’d like to test drive some mobility scooters please call (03) 9568 8383.